Cadets listen intently to a speaker. Cadets are students first. Most of our cadets participate in typical college activites and organizations such as fraternities, sororities, intramural sports, clubs, etc. There are hundreds of student and campus organizations available to students at Miami University. AFROTC is the best way to earn a commission as an United States Air Force officer while still enjoying a social college experience. Come check us out! all while serving your country in the best Air Force in the world! 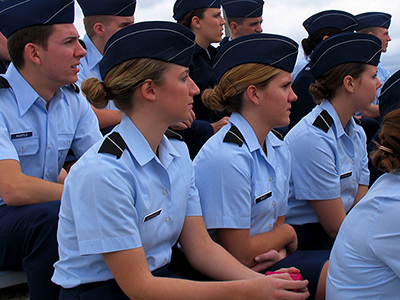 We provide you with the platform to launch a successful career in one of many exciting Air Force fields. All uniforms are provided free. All Aerospace Studies textbooks are provided free. Unless you are on a scholarship, you can try out our program for 2 years without obligation.